I’m super-excited to go back to the Savannah Book Festival this year. I’ve been once before, and I reported to you its unexpected delights. I’m getting ready by reading a huge pile of books. But, lately I’ve been half-nervous that a librarian is going to pull the plug on me because I have been using the crap out of the library. 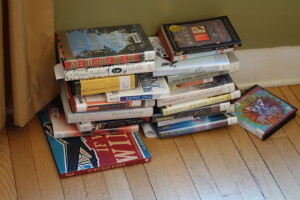 Yes, I know, I know, librarians want us to read, and I should be fine and everything, but I also know that when you’ve got a pile like this. . .
. . . and it doesn’t actually include all of the books that you’re currently borrowing, well, it could be construed as greedy. Or possibly some sort of hoarding problem. But here’s the deal: first, the way the festival works is that several authors are all speaking at the exact same time at different venues, so I’ve been trying to game my way through the reading so that hopefully I’ll have at least one author that I know that I love-love-love for each session. Even so, I know that this festival will be full of tough choices and potential heartbreak. As if that’s not enough to think about, I’m also trying to entice the rest of my family to embrace the various authors. So I’ve been checking out books for myself and for all of them, and I’ve been “scouting out” books as possible audio books that we could all listen to together. Every time I go to check out books I imagine that there’s going to be some sort of computer beep that alerts the librarian that I’ve exceeded the (hopefully mythical?) limit. And meanwhile I keep coming up with more reasons why I need other books, like when the Working Group on Girls of Schenectady decides that we’re going to team up with One County, One Book and read Brown Girl Dreaming, or when a random man insists that there’s a book you must read. Incidentally, when I encountered this gentleman, the younger woman with him said, “It must be a good book, because he tells just about every person he sees that we have to read it.” And I thought, how the hell can you spend that much time with someone who speaks that passionately and frequently about a book without ever actually trying to read the damn book? Baffling. But I digress. Among the books I’ve checked out were a bunch that I would classify as “testosterone thrillers”–think, you know, along the lines of Tom Clancy and such. I wanted them available for Cute W, but I was also trying to broaden myself and get a few super-quick reads under my belt. This attempt pretty much flopped. Just not my cuppa. In fact, for one book, I actually quit on page 1. Harsh, right? I can’t remember what exactly turned me off so very much, so very quickly, and I’m too polite to mention a book by name, but, let’s just say that most of these have been returned to the library already. One rather peculiar thing happened while I was on the hunt for Rita Mae Brown books as part of my Library Quest. She’s written a whole slew of mystery books that somehow involve cats, which just doesn’t call out to me, but I also know that she’s a super-popular author, and I figured that the books would be light enough for youngsters. So in the process of geekily researching this, I stumbled upon Rubyfruit Jungle, an old book that’s recently been re-released as a classic and which has unbelievable reviews. Plus it’s a coming-of-age novel, so I figured: there it is. The book to try. Then I checked the library catalog online, and according to the library, they had no copies. At all. Not just at my local library or the downtown library, my usual go-to libraries, but at any library in the entire system. Which hardly ever happens. Given the Amazon profile, it seemed crazy. Anyway, on one of my trips to my local library, I just decided to scan the section with Rita Mae Brown to see if there were other books that didn’t involve cats. I love my cat, but I have an irrational fear that reading a cat mystery would bring on menopause. So I’m looking at the shelf, and guess what was there? A copy of Rubyfruit Jungle! It had the Schenectady Public Library sticker on it, but when I went to check it out, the book wasn’t in the system! So weird. And somewhere along the line I had figured out that the reason why The New York Times called it “groundbreaking” is because the protagonist is a lesbian, and the book came out back in the early 1970s. So I had to wonder: was there some sort of censorship drama 20 or 30 years ago? And so then they expunged the record of the book’s existence, but left it on the shelf so that budding lesbians would know that they weren’t alone? I just love the idea of it! And it sounds like something that a vigilant librarian would do. I once worked as an assistant for a librarian who pointedly didn’t tell her supervisors about some of the material she collected because she feared that they’d try to expunge the items from the official record. I have a librarian friend who, after several drinks, has said, “I don’t want to overstate it or anything, but we librarians make democracy possible.” I believe you, sister. Now the question is, do I ask a librarian if they want to add it back to the system or just quietly slide it back onto the shelf? Something that’s made me a little bit crazy during my library book binge is that twice I’ve encountered “corrections” made by previous readers to the text of a book. Now, here’s the deal: I hate typos as much as–more than–the next gal. But these “corrections” were each judgment calls, and in each case, I believe that the judgment was poor. In one, the self-proclaimed editor circled an F-bomb that a character said with the chiding, “Unnecessary.” Excuse me, but f&*k you! Perhaps the author chose to have this normally-very-polite-and-wholesome character say this word to illustrate the extraordinary stress of that particular moment? Making the use of the term, for the author’s purposes, in the author’s opinion, completely necessary. Seriously, lady (don’t ask me why, but I could just tell by the sniffy little print that this was a lady), write your own damn book, and don’t screw around with other people’s unless they’ve asked for your opinion! In another book, someone added a word to make a sentence complete, when, from what I read, it seemed pretty obvious that the character speaking was using a halting, tentative tone with the kind of long pauses best signified by a freakin’ period. Which is what the author placed. In the middle of a fragment. For. Goddamned. Emphasis. It might not be to your tastes, oh person-who-wants-to-spare-us-from-divorced-subjects-and-predicates, but the author did this on purpose, and you are not the author, and if you want someone to read your words, you need to write your own book and lay off of other people’s books. Along the way, I’ve come up with some new favorite authors, and I’ll tell you about them once I’ve figured out who-all is on my love-love-love list. Back in the late 1970’s, when I was a library assistant in a Texas middle school (substitute medium security prison here and you get the picture), one of my most important jobs was to scour the Newsweek and Time magazines we received and use a magic marker to color in clothes on anyone who was pictured naked. I. AM. NOT. KIDDING!